Gives you 100 total channels, M06/M03 come with this standard. WELL WORTH THE UPGRADE! Adds CTCSS decoding to the Radio. Can be costly. Buy only if you need it. Screws and such for the backet. Don't bother. Go to the hardware store. 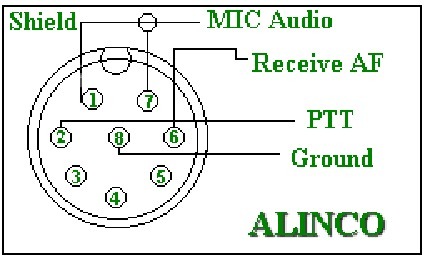 Most Alinco Mics from the entire DR/DX series are interchangeable to a degree. Most any Alinco MIC with the 8 pin jack will work just fine. The major exception being the mics for the DR-140/605 mobiles because of course they have an RJ style jack. Newer MICs with remote functions can be used but the remote function on the MIC won't work. Some of the backlit mics might function but not light up. Some Alinco MICs have a button on the back to slide into a mic holder, others have a hook. The EMS-14 desk mic also functions perfectly on these models. So if your old Alinco mic gives up the ghost, shop around. Good choices are the EMS-55/EMS-56 for DTMF and the EMS 53 for non DTMF. The EMS-57 will work but a lot of the fancy functions on the mic won't function. AVOID the EMS-57A at all costs, it's a special purpose mic. If you want to wire in a another brand mic.....here is the wiring diagram.